I read Marguerite Yourcenar’s Memoirs of Hadrian while reclined on a porch in the south of Spain this winter. Unwittingly, I entered the mind of Rome’s most emotion-led emperor a near 100km from where he was born. It was as serendipitous as any good read; a twist of fate through the contours of your own life’s events, a dream within your own. So yeah, I sipped Spanish wine and learned a great deal about a Roman emperor I’d only ever heard referred to as a precursor for Braveheart. Though Hadrian dealt with a lot in his life (the reunification of his empire to say the least), the best of Yourcenar’s work details the rise and fall of his love for the youth Antinous. His reflections, as imagined here, were crushing in the way a great love as told in the past tense are and must be. Early, before things fall magnificently apart, Hadrian muses on the dangers of falling so hopelessly in love. He wonders if there is some solution to the problem of two beings becoming so close, if there is some way to prevent a crash. Is there a way on and not out? “If souls possess an identity of their own, can they be interchanged, going from one being to another like a segment of fruit or the sip of wine which two loves exchange in a kiss?” Is there forever? Is there a kiss? In the end, Antinous solves this quandary for his lover. In a last act of loyalty, he drowns himself in the Nile, told by a priestess that his sacrifice would extend the life of his emperor while sparing him the thing he feared most: age. The loss of Antinous plagues Hadrian for the rest of his life. He takes other lovers, he has other adventures, he raises more cities, and fulfills his legacy spectacularly; but, to him, without. He never recovers of Antinous, chiefly the deep friendship he felt for the grecian youth. In the end, stricken with grief, he deifies him. He raises a cult around him. And so the life of Antinous, and Hadrian’s love for him, ends not with the silt of the Nile, but goes on. Weaved through history's text. Within a week of finishing the Memoirs, I stood deep within the sculpture gallery of Madrid’s Prado Museum, face-to-face with Hadrian’s bust. I wondered which of Yourcenar’s words could have come from this ancient person’s lips. Certainly the facts were there. He had lived. He was an emperor. He had perhaps even been in love. But what of the details, the piercing, heart-wrenching details of that love? Had it all been a great fiction, projected? Did this man with the perm wonder of interchanged souls? But then, from the corner of my eye, I noticed how his gaze met that of another on the opposite side of the atrium. I turned, and sighed in relief. I didn’t have to walk the ten steps to know it was familiar. Antinous, there, eyes calling back. Centuries into forever. Before the Astro Poets entered my life, I was a skeptic, a naysayer, and a prude for all things ~the stars~. The closest I had come to astrology was deeply and cynically making fun of it through the writing of “Horrorscopes” for my blog (you should always know your worst case scenario, as well as your worst case blog). But then the year turned 2017, I started to give up on cynicism, and Twitter’s greatest poet astrologers entered my feed. I am a Capricorn. Yawn if you’re not surprised. Thanks to @poetastrologers I now know that I am also a rolling pin, an ode, a downloader of resumes on first dates, a deadline-obsessed idiot, a warning for the screaming neon thesis: “if you are to “get me” you must first file your dissertation on "Capricorns & other modern divinities" ASAP, then forward the email to them to prove you did it” (lol). It’s easy to roll eyes at yet another space on the internet that pushes out mass generalizations in the form of memes, gifs, and jokes. Just as it can be cumbersome to navigate yet another arena of assigned personalities. But also, if I may use a technical term, Who The F Cares. The Astro Poets (real-life poets Alex Dimitrov and Dorothea Lasky) bring a levity and lightness to the vast uncertainty of life among the planets, stars, and twitter avatars. There’s a deliciousness to scrolling through their page and ingesting their universal, versed truths. Not everything has to be serious, or analyzed, or scientific, or even true. Sometimes things, and people, are just rolling pins. And it makes sense. I get it. We’re looking for handshakes and hugs out here, dummies. We’re looking for explanations. We’re looking, indeed, for hope. To borrow again from Hadrian: “When all the involved calculations prove false, and the philosophers themselves have nothing more to tell us, it is excusable to turn to the random twitter of birds, or toward the distant mechanisms of the stars.” And maybe so, to both. I picked up The Audacity of Hope by Barack Obama during my freshman year of college, 2012. He had written it six years before, at the beginning of his campaign to become president. Now he was up for reelection. I had just turned 18 and couldn’t have been more excited or proud to perform my civic duty at such a historic time. I joined my university’s Young Democrats and listened to speakers unpack the confusing language of important legislative measures that would be on the ballot. I also joined the four-member Amnesty International club, of which I aspired to become president. That November, my friend Hannah and I gathered around our tiny dorm room television to watch our favorite politician be reelected. We rejoiced. And then we moved on. I never finished the book. I forgot about Young Dems and Amnesty. Liberalism had won and that I’d played my small part in that victory. And now here we are. The complacency of myself and many others in this country led us to the election of an unqualified tyrant who will spend his four to eight years in office trying to destroy every bit of progress and equality Obama’s administration built. President Obama was not a perfect person, nor was he a perfect politician nor President. But he was one of the greatest orators of our time and has become a symbol for American hope and possibility. It’s nice to now revisit this book as inspiration to keep going and fighting and believing. We have to finish what we started. I highly recommend the read, as well as listening some of his best speeches (here’ are videos for his Charleston eulogy for state Senator Reverend Clementa Pinckney, in which he condemned the Confederate flag and led the congregation in singing “Amazing Grace,” and his speech at the Edmund Pettus Bridge in Selma on the 50th anniversary of Bloody Sunday). And finally, watch his recent Letterman special for a lighter memory of when America’s cutest, goofiest dad ran our country. 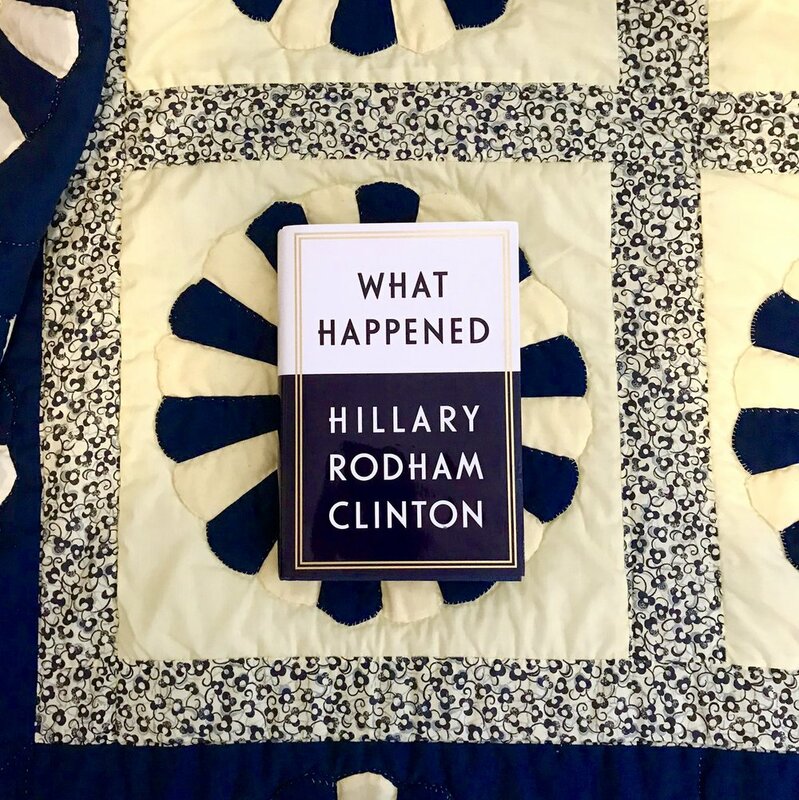 Hillary Clinton discusses What Happened. Tavis and I stayed up all night watching the election results on November 8 and since then, I avoid revisiting those horrifying hours which culminated in one of the most insane moments in the history of America and the world, as well as me experiencing a brief breakdown in the kitchen of our West Hollywood apartment. I will never forget dancing to “Under Pressure” at Melrose Umbrella Company the weekend just before that election. I have never felt a truer moment - I was fresh to Los Angeles, young and free and poor (still am), hopeful about the future of America and of my own life. And yet I had a nagging, sinking feeling during the playing of that 1982 song… it felt so relevant, too relevant. The Southern suburbs I had just escaped from provided me with plenty proof that not enough has changed in this country since the Reagan Era. I was excited and hopeful, but also so, so scared. No one, not even Chelsea or Bill, can truly know how excited and hopeful and scared Hillary must have felt not just on election night, but for the entire two years that she ran, and probably long before that. Her book, however, attempts to reveal just that: her reasons for running, her feelings while doing so, and her miraculous ability to forge onward with a graceful and undefeated spirit.